Whoa, is it Day 12 already? 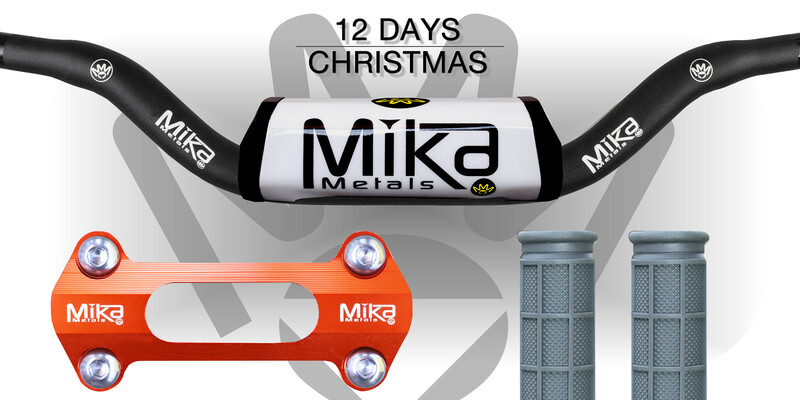 Let’s wrap this up with a batch of goodies from Mika Metals. The Mika RAW Series handlebars ($109.99) are designed for maximum comfort, as their unique tapering maintain strength strength while having the optimal amount of flex to minimize arm fatigue. Constructed of T6 7075 aluminum, Mika claims they’re as strong or stronger than any non-crossbar handlebar on the market. The bars are black, are available in 12 different bends, and the pads are available in black, white, orange, red, yellow, and blue. Of course, with Mika’s 1-⅛-inch RAW Series bars, you’ll need some oversized Mika Bar Clamps ($59.99), which are precision machined from Aerospace 7075 aluminium. They’re rubber-mounted using the stock rubber cones, and are available in four different colors; including black, silver, blue, and red. You can cap off the bar setup with Mika’s Dual Density 50/50 Waffle Grips ($12.95), which are constructed from an advanced dual-density rubber compound, The 50/50 grips are specifically designed to increase finger traction while minimizing palm blisters. The dual layer provides reduced vibration which provides less hand fatigue. Need more info? Visit mikametals.com. That's it! Get your comments in for a chance to win, and head back and hit up any of the days that you've missed! We'll pick the winners sometime before Christmas. I'd like to try a setup.